Oil sands are a mixture of an extremely dense form of petroleum called bitumen with sand and clay. They are found in large quantities in Canada and Venezuela. Heavy oil, extra-heavy oils, and oil sands are viewed as strategic resources that can supplement the global supply of conventional hydrocarbons, and meet the growing demand of hydrocarbon resources. About 4700 billion bbls of in-place reserves are available worldwide, and 1000 billion bbls of these heavy and extra heavy oils are considered recoverable reserves. Canada, specifically Alberta, has over 2000 billion barrels of bitumen and heavy oils (NEB-EMA 2006). However, deposit quality which is assessed through its API gravity, tends to be low, between 7 to 10o API. In contrast, conventional light crude oil typically has API gravity of over 31o. Yet, this non-renewable resource occupies a very important place in the energy scenario of North America and the world. Heavy oil, bitumen, oil sands, and oil shales are the future of the petroleum industry. Alberta’s proven oil sands reserve is estimated to be between 172 to 315 billion barrels of petroleum (heavy oil or bitumen) distributed over 140,000 square kilometers (Speight and Berkowitz 1975; NEB-EMA 2006; Richardson 2007). This places Canada in second position (following Saudi Arabia) in the World in terms of the size of the reserve. Currently, Canada is the largest foreign supplier of petroleum to the United States. A large fraction of the oil being exported to the USA is produced from the oil sands. Currently, 1.2 million barrels of diluted bitumen (dilbit) or synthetic crude (syncrude) a day is produced from the oil sands. This number is expected to triple by 2020 (Richardson 2007). In Alberta, bitumen is generally extracted using either open pit mining or thermal enhanced oil recovery (thermal EOR) techniques, often referred to as in-situ techniques (NEB-EMA 2006)(Isaacs 2005). The choice of the recovery technique depends on the depth of the oil sands formation from the surface. Near the Athabasca river basin, the overburden (top soil) covering the oil-sands-bearing strata becomes very thin, allowing its excavation through open pit mining techniques. Although mining constitutes the most visible activity related to oil sands extraction at present, nearly 80% of Alberta’s oil sands resources are located below 70 meters from the surface, rendering them unsuitable for exploration using mining. A majority of the upcoming oil sands projects are based on in situ operation (Isaacs 2005), using variants of enhanced oil recovery (EOR) technologies. Principal zones of the oil sands formation dictating the extraction techniques employed. 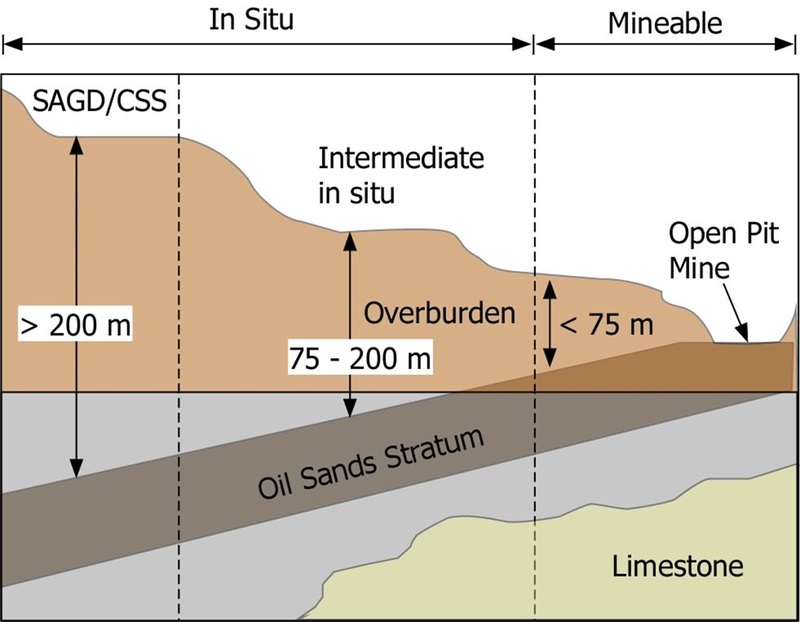 Mining operations are restricted to the Athabasca River region (overburden < 75 m), whereas steam assisted gravity drainage (SAGD) or cyclic steam stimulation (CSS) are employed in the deepest strata (> 200 m). The most commonly used in situ technique is steam assisted gravity drainage (SAGD) or “thermal EOR” (Isaacs 2005). This technology is suitable for very deep (buried over 200 m) deposits of bitumen and heavy oil. 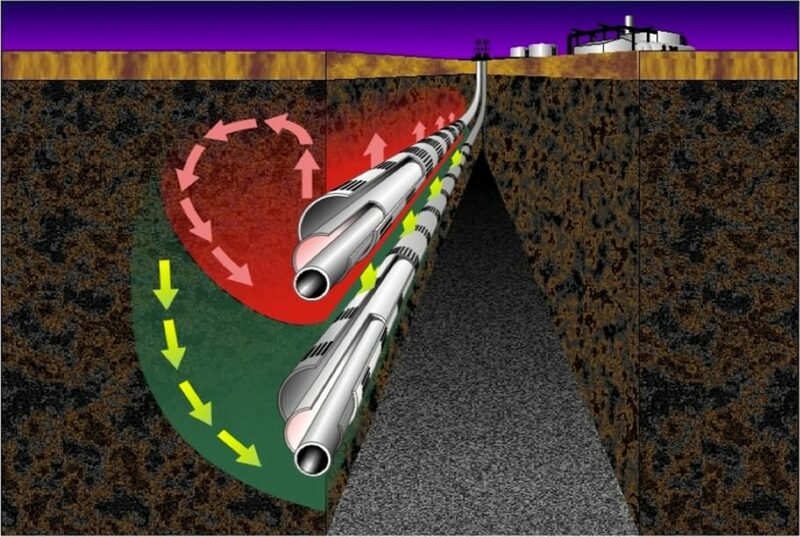 In SAGD, a pair of horizontal wells is drilled underground into the oil sands bearing stratum. Saturated steam at around 550 psi pressure is injected into the formation through the upper well, which reduces the viscosity of the bitumen that then flows, under the influence of gravity, into lower, strategically placed, extraction wells within the steam chamber, where a mixture of bitumen and water are recovered (Isaacs 2005). The bitumen is separated from the water, and the water is recycled to produce steam. SAGD plants can be considered to be water treatment plants with bitumen as a by-product. Considerable expense is involved in treating the produced water that is extracted along with the bitumen to produce a sufficiently clean feed water for the steam generator. The steam is again fed back into the oil bearing reservoir. Compared to open pit mining, in-situ extraction has a lower impact on the surface environment, consumes less water and reduces the need for land reclamation efforts. In situ extraction will be used increasingly in the future. Schematic of a SAGD process (courtesy: Suncor Energy). Alberta has over 2 trillion barrels of heavy oil and bitumen, of which 175 – 315 billion barrels are currently recoverable. One of the in-situ recovery methods is Steam Assisted Gravity Drainage (SAGD). Each barrel of bitumen produced by SAGD requires about 3.0 bbls of water, over 90% of which is recycled (thus requiring only about 0.1- 0.2 bbl of freshwater). Assuming production of a bitumen plant is 100,000 barrels of bitumen per day, the water treatment requirement of the plant is about 300,000bpd (~12.6 Million Gallons per Day, MGD). The steam assisted gravity drainage (SAGD) process is fairly water intensive compared to conventional petroleum production; approximately 3 barrels of water is necessary to produce one barrel of bitumen with SAGD. The water is used as steam (at approximately 550 psi pressure) and injected deep underground to the oil-sands-bearing strata. The steam lowers the viscosity of the bitumen, which is then drawn out of the ground, along with the produced water. A majority of the produced water is actually the condensed steam that was originally injected, with only a small fraction being water that was originally underground with the bitumen. A producer well extracts a bitumen-water mixture containing about 25 -30% bitumen and 75-70% water. After removal of the bitumen, the remaining water is purified and re-converted to steam. The freshwater requirement in SAGD operations is approximately 0.1 to 0.2 barrels per barrel of bitumen produced. This number may seem small compared to the amount of freshwater consumed during production of mined bitumen, or even coal production. However, because SAGD operations are often located in regions where the only source of freshwater is groundwater, there is the potential for a freshwater shortage if a large number of SAGD plants become operational in these regions. The high salinity of groundwater can also be an issue for the SAGD process. Often deep aquifers can contain extremely large amounts of salt (indicated by a quantity called TDS, the Total Dissolved Solids). SAGD plants generally utilize two methods for producing bitumen: the inverted (hot) process, and the diluted process. In the inverted process, the bitumen-produced water mixture is heated up, and separated using “inverted” gravity settlers (high temperature API separators). In the diluted process, the bitumen-water mixture is diluted after extraction from the producer well, and then all processing is done at a lower temperature. The diluted process requires use of naphtha as a diluent, so a large source of naphtha is necessary. The steam for each of these SAGD methods is produced in boilers called once-through steam generators (OTSG), which burn natural gas to produce low pressure (550 psi), low quality (80%) saturated steam. The industry is considering the implementation of package boilers, which will require more stringent water treatment. At AWRL, we are interested in developing low energy water treatment processes that will yield cleaner water, which can be used as feed for high pressure package boilers. In conventional diluted SAGD, organic diluents are added to the produced fluids to reduce the viscosity of bitumen. The diluted bitumen and the produced water are first separated to isolate residual oil from the produced water. The de-oiled water is then treated prior to recycle in the SAGD process. High levels of organic matter and silica in recycled water cause numerous operational problems, such as, the fouling of pipelines and equipment and clogging of injection wells (Wang et al. 2005; Jennings and Shaikh 2007; Guha Thakurta et al. 2013). Replacing the current scheme with a process which yields higher quality of recycled water will significantly reduce capital and operating costs (Heins 2009). Membrane separation processes have been widely applied in industrial wastewater treatment; however, there is limited literature on their application in the treatment of oil sands produced water. The few studies that have been conducted, concerned the nanofiltration (NF) of water produced by surface mining of the oil sands (Peng et al. 2004; Kim et al. 2011), which is significantly different from SAGD produced water in terms of concentration and nature of the organic matter (Mehrotra and Banerjee 1986; Peng et al. 2004; Kim et al. 2011; Guha Thakurta et al. 2013). In fact, organic fouling is more severe in the SAGD process (Sadrzadeh et al. 2015). 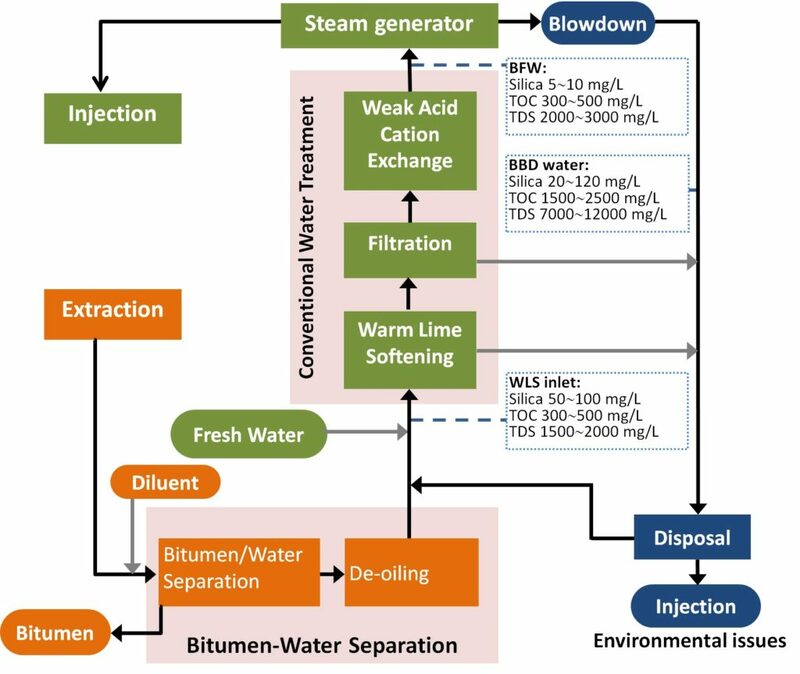 The total organic carbon (TOC) and total dissolved solids (TDS) in the main streams of SAGD process, i.e., warm lime softener (WLS) inlet, boiler feed water (BFW), and boiler blowdown (BBD) water are shown in the Figure below. The high susceptibility of membranes to fouling by high TOC and TDS concentrations, as well as the high temperature and pH of SAGD water, create challenges which are the focus of the AWRL’s research projects. The water treatment industry is working on the development of both polymeric and ceramic membranes to tackle these challenges. Polymeric and ceramic membranes have advantages and disadvantages and, as each technology develops, each one will find its most appropriate area of application. This project will focus on polymeric membranes, as they present some distinct advantages over ceramic membranes. Polymeric membranes are cheaper, and their composition allows for a high degree of surface chemistry customization to tune their separation and antifouling properties. Their main disadvantage, historically, has been an inability to resist high temperatures. The development of mixed matrix (hybrid) membranes combines the low fabrication cost of polymeric membranes with the high-temperature tolerance of ceramic membranes. This high thermal stability will open new fields of applications to the membranes and prolong their use under high temperatures and in chemically harsh environments, and potentially replace current techniques applied for oilfield water separation. Heins WF (2009) Technical advancements in SAGD evaporative produced water treatment. J Can Pet Technol 48:27–32. Isaacs E (2005) Canadian Oil Sands: Development and Future Outlook. Jennings DW, Shaikh A (2007) Heat-exchanger deposition in an inverted steam-assisted Gravity drainage operation. Part 1. inorganic and organic analyses of deposit samples. Energy & Fuels 21:176–184. Mehrotra AK, Banerjee A (1986) Evaluation of reverse osmosis for the treatment of oil sands produced water. Water Pollut Res J Canada 21:141–152. Speight N, Berkowitz JG (1975) Oil sands of Alberta. Fuel 54:138–149.